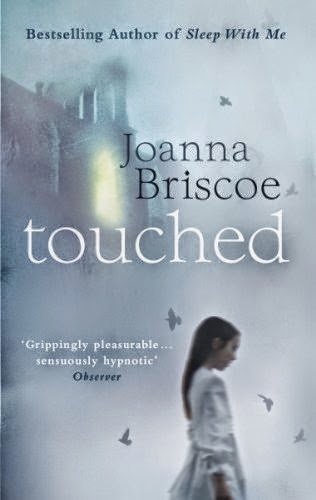 Touched is another of Hammer's series of horror novellas by well-known authors, which also includes Helen Dunmore's The Greatcoat (excellent), Jeanette Winterson's The Daylight Gate (disappointing) and Sophie Hannah's The Orphan Choir (another excellent one). I find it hard to resist this series at the best of times, and when I read that Touched was partly inspired by Joanna Briscoe having spent her early years in the village that formed the setting for the brilliant film The Village of the Damned, which was in turn adapted from the novel The Midwich Cuckoos by my hero John Wyndham, I was never going to be able to last long without reading this one. multiple sinister threads into one increasingly unsettling narrative. In 1963 the Crale family - parents Rowena and Douglas, non-identical twins Rosemary and Jennifer, loner Evangeline, toddler Bobby and newborn Caroline - move into a cottage formerly occupied by Douglas's elderly mother in an idyllic village, and set about knocking down the wall between it and the house next door in order to make it into a family home. However, the house seems reluctant to cooperate. Damp patches appear; strange smells come and go, from cat pee to disinfectant and an old woman's perfume . Little Bobby talks of mysterious intruders, and Rowena is plagued by nagging sensations that there is a sixth child in the house. If you're thinking this sounds like a standard haunted house narrative, it's really so much more than that. There's also Evangeline for a start, who talks of an imaginary friend, insists on dressing in her grandmother's old Victorian clothes, and forms an unlikely, disturbing friendship with Pollard, the local builder working on the house, and his childminder wife. There's Jennifer too: unlike her stolid, reliable twin Rosemary, Jennifer is stunningly beautiful, so much so that her looks are constantly commented upon even in her early teens. Yet when Jennifer is asked to play a one-line part in a film being made on location at the village, she seems strangely, eerily vacant on camera. There's an enormous amount going on in Touched, and it's not always clear what might be supernatural and what might be a more earthly threat. If I did have any complaint about this book, it would be that there are perhaps too many plot strands for such a short novel - I could happily have seen it spun out for another 200 pages - but that's not exactly a damning criticism. Touched is not only (very) creepy and unsettling like all the best ghost stories are, it's also beautifully evocative of its setting and period. This is a deeply worthy addition to the Hammer series.